If you've got a Custom Domain set up, you can configure our iTunes / Amazon Link Engine Plugin to use that instead of buy.geni.us. This allows you to maintain strong personal branding on your Wordpress blog, while still globalizing and affiliating your product links using our service. 1. 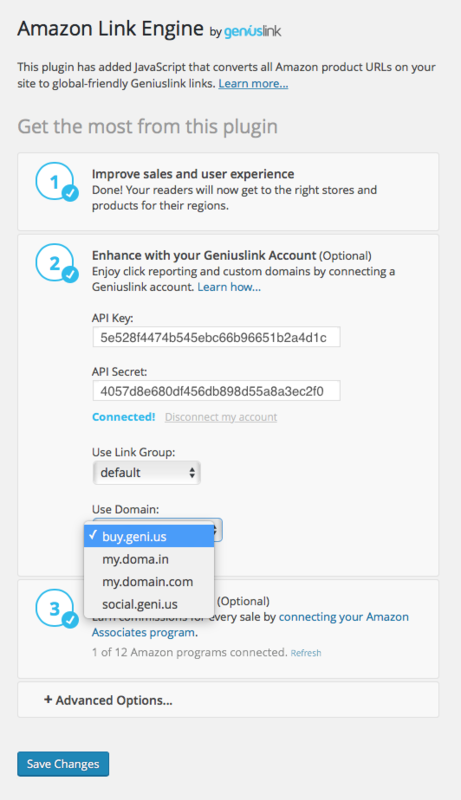 First, make sure that you have correctly set up your Custom Domain with the Geniuslink service. 2. If your domain has been added to your Geniuslink account, log into your Wordpress site, and navigate to the Plugins tab. 3. From here, find either the Amazon Link Engine or iTunes Link Engine plugin, and click on Settings. (Note: be sure that the plugin is Activated on your site first). 4. If you have not already connected the ALE or iLE Plugin, you will need to add your API keys to connect the plugin to your Geniuslink Account. That's it! All of your links will still be globalized and affiliated through our service, but will show your own custom domain!